Gail Friedman: We can't control what happens to us or our loved ones. What happens when Annie goes to college? Will: What are you saying? Gail Friedman: People get hurt. There's only so much we can do to protect ourselves, our children. The only thing we can do is be there for each other when we do fall down to pick each other up. This movie deserves nationwide distribution. It is a riveting story and although difficult to stomach at times, it's a MUST SEE for kids, parents and teachers. I saw this movie last night with my Cinema Society and was appalled to hear that the movie was pulled from distribution. 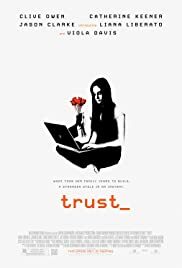 Are we such a sick society that opts for violence and science fiction movies at the expense of a life altering film as Trust. David Schwimmer is to be applauded for tackling such a disturbing subject matter. The acting was superb- Clive Owen, Catherine Keener and Viola Davis did a superb job. The crime in this movie beyond the obvious is that such an important film will not be seen by all the people in this country that need to see it. 115 of 159 people found this review helpful. Was this review helpful to you?